Home|Floral Library|Peony – Paeonia lactiflora and P. spp. Most cultivars tested can be harvested in the bud stage with just a hint of color showing and still open to maximum size. Three cultivars that require somewhat more mature flowers at harvest are ‘Elsa Sass’, ‘Ann Cousins’ and the reported matriarch of this species, ‘Sarah Bernhardt’. Try to never harvest flowers when they are wet in order to reduce the chances of Botrytis development. Flagging is a term used to describe a harvest stage of peonies. 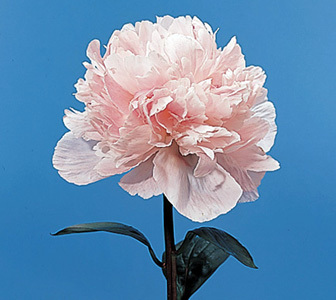 Specifically, when 1 or 2 petals are unfurled from a peony bud which is an indication that the bud can be harvested and opened off the plant with good vaselife. This proper harvest stage is mostly for red colored cultivars as many non-red ones should be harvested slightly earlier. Store at 36-41F, stems in the bud stage can be stored dry up to 4 weeks at 32F if properly protected against the fungus Botrytis using pre-storage fungicide treatments. Never attempt to store when the flowers and/or foliage are wet. From the Greek “paionia”, possibly derived from Paion, who was the physician to the gods and used plant medicines. Zeus changed him into a plant to save him from the healing god Asclepias who was jealous of Paeon’s ability to heal. Although they bloom only in the summer months, Peonies can survive for a century or more if undisturbed. Ranging in color from white to pink to deep red, the Peony was a popular flower in England during medieval times, and was a staple in many monastery gardens. The specific epithet name “lactiflora” means milk-colored flowers. In the publication entitled “2000 Production and Postharvest Evaluation of Fresh-Cut Peonies,” Karen Gast (2000) presents a comprehensive list of cultivars with their corresponding production and postharvest characteristics. Anyone wanting to grow or who is growing peonies should get a copy of this publication. In short, flowers produced per plant ranged from 3-15 while vaselife ranged from about 5-9 days.